Maybe it's because I am tired and it's late but I can't seem to figure this out. Below is a screen shot of a question complete with the answers which have been provided in red. I can't for the like of me work out how £2904.00 is the correct answer to part b). Maybe I'm misunderstanding the question, maybe there's a mistake in the answer. Part a) I have answered no problem, but I have part b) down as £1531.20 calculated as (£8 x 16.50%) x 1,160. I'm not sure where you got 1160? Are you reading one of the figures incorrectly? I just saw the 1160 as the total hours and see why you have used this. The bonus RATE has been worked out based on 16.5% of the hourly rate of £8. 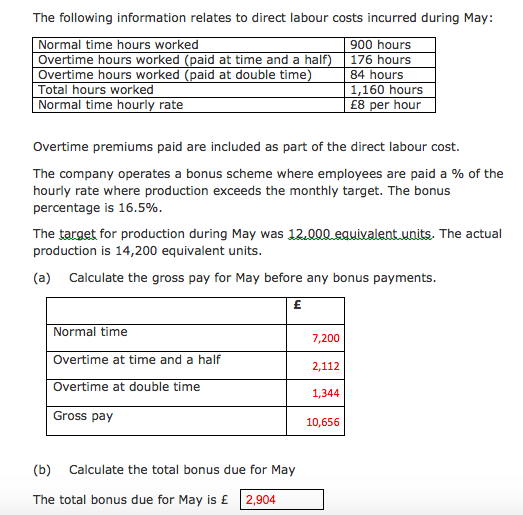 However this bonus is dependent on the units produced in excess of the target and not the total hours worked.